Holroyd Brass recently celebrated its 40th anniversary. During the past 40 years, there have been many members that have come and gone, and some have even come back again over the years. This just goes to show what a great band we are, and our doors are always open! 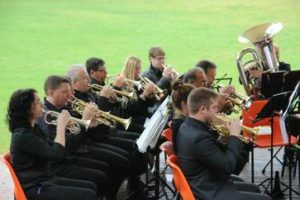 Recently the band organised a ‘Blow In’, encouraging both past and present band members to come along for a relaxed afternoon of playing fun and entertaining music. The band also encouraged community members to come along and pick up an interment and join in the fun. Aspiring conductors in the band where also encouraged to take the baton and try their hand at conducting a few pieces as well. ‘Blow Out’ – a free performance at Merrylands Central Gardens, providing an afternoon of free entertainment for the community, and friends and family of the band to come along with a picnic and listen to some great music. Despite the earlier rainy weather on the day, the performance was a huge success! The Blow In series is only going to get bigger and better, so stay tuned to find out when the next one will be!